We shall fight them on the beaches. It’s not an exact quotation – Churchill did not include the word ‘them’ – but the power of the language is undeniable. At the same time, the speech is not well understood, and many myths have grown up around it. The full speech can be read here , courtesy of the Churchill Centre. In order to appreciate it fully, it’s necessary to grasp the very precise circumstances in which it was delivered on 4 June 1940: shortly after the successful evacuation of British troops from Dunkirk, but before France’s final defeat and surrender to the Germans that took place later that month. Here are some facts about this magnificent oration that you may find surprising. Rather, he gave it in the House of Commons, beginning at 3.40 pm and sitting down at 4.14. By contrast with some later occasions – notably his ‘finest hour’ speech of 18 June – he did not repeat it over the airwaves that evening. The thought simply does not seem to have occurred to him or to anyone else. Instead, a BBC announcer read sections of it during the nightly news. You have, of course, heard him delivering it, but he did not make that recording until 1949, when he was persuaded to do so for the benefit of posterity. 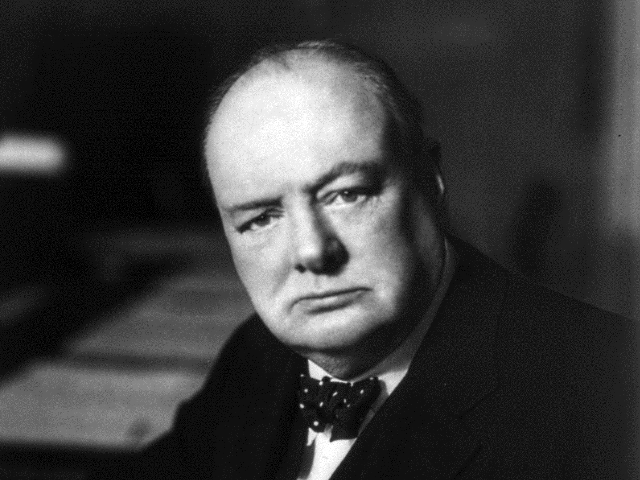 Few people, when they hear the speech on radio or TV documentaries, are aware that they are listening to Churchill speaking not in 1940 but nine years later.Strangely, though, there is a popular myth that the speech was broadcast at the time, not by Churchill himself, but by an actor, Norman Shelley. Shelley did make a phonograph recording of a different Churchill speech in the aftermath of the 1942 victory at El Alamein although what use was made of it, if any, is unknown. He never claimed to have impersonated the Prime Minister over the airwaves, and though many historians have pointed out that the story is false, it seems impossible to kill it. Why did Churchill say this? Why did he choose to qualify his great heroic statement in this way? After all, it gave Nazi propagandists the chance to claim that he was planning to skedaddle, as according to German radio,the war could, of course, never be conducted from another hemisphere unless Churchill and his confederates were there to conduct it. In fact there was a compelling reason for him to make this statement, which was that the American government wanted him to. The USA of course was still neutral at this stage – Churchill’s initial draft included a reference, which he later deleted by hand, to its ‘strange detachment’ in the face of the Nazi menace. However, President Roosevelt made clear via secret channels that he wanted a commitment from Britain that even if she were defeated she would not surrender her fleet but would send it to South Africa, Australia, Canada and other parts of the Empire. If this were done, American intervention could be expected to follow quickly, he promised. So Churchill was giving him the message that he wanted to hear – a message that is now largely forgotten. In the House of Commons, some members were moved to tears, but by no means all of them. Although the Dunkirk evacuation had been a remarkable success in its own terms, it had only been necessary because of the sweeping German victories that had humiliated Britain and her allies. Churchill rightly acknowledged that what had happened in France and Belgium had been ‘a colossal military disaster’. The Labour MP Emanuel Shinwell recalled:We were very much depressed as a result of the events that led to him making this speech, and all his oratory could not remove that depression. a great section of the Tory Party were not behind Winston & had received his great speech […] even in sullen silence. The grave tone of Churchill’s speech made some impression and may have contributed in some measure to the rather pessimistic atmosphere of today. […] The contents of the speech were on the whole expected but some apprehension has been caused throughout the country on account of the PM’s reference to ‘fighting alone’. This has led to some slight increase in doubt about the intentions of our ally [France]. Here we see the significance of Churchill’s remark that he was confident that Britain could continue the war for years, ‘if necessary alone’. At this point the French were still in the war, so the hint that they might drop out was alarming to many. Churchill’s warning was timely and necessary but, by the same token, the concern that it generated was also wholly understandable. It may well be true that millions of people were, at the same time, galvanised and invigorated by the speech. But the recorded reactions of contemporaries show us that Churchill’s task was in some ways more complicated than is generally credited. To make note of the complexity of the origins and responses to this wonderful speech by no means implies criticism of Churchill. Rather, it prompts us to rethink the factors that contributed to his oratorical success. He did not merely provide uplifting soundbites; he presented a factual and reasoned case, provided the public with new information and, crucially, provided them with the context necessary to understand it. He was willing to run the risk of depressing his audience if this would serve the greater purpose of bringing them into contact with reality; he did not attempt to win easy popularity by providing false hope. He followed this formula throughout the war, not always with complete success in terms of audience response, but with the ultimate achievement of establishing his credibility as someone who would deliver the facts no matter how unpalatable they might be. This is a lesson which modern orators will do well to follow. Copyright Professor Richard Toye. This article was produced as part of the No10 Guest Historian series, coordinated by History & Policy. Keep tabs on the past - sign up for our email alerts. "provided the public with new information", "run the risk of depressing his audience if this would serve the greater purpose of bringing them into contact with reality". After nine months of doing nothing I'd say it wasn't the public who needed 'contact with reality'. I recently came across this whilst researching a speck of my own and it was certainly eye opening to see that this speech as heard today occurred some 9 years after the event. It also gives a lesson in context and the message that can be derived based on who is listening ( as per the Americans comment ). Sasori, Churchill came to power on May 10th. He was not the one responsible for the British "doing nothing". A wonderful man, it was because of Sir Winston, and how he overcame the enemy, that I decided to join the party. I will never let him down. words. He will long be remembered in history. I am 86 and was 11 when I heard on the radio from Chamberlain that we wre at war with Germany. I remember my mum and dad coming in from work and holding each other and mum crying. family and would stick together at home. We had air raids on my home city of York. I remember the wail of the sirens and sitting under the dining table in our appartment over a garage we lived in. I walked with my brother to look around next morning and saw the bomb damage in the city. We dont war again, it is a dreadful thing and I hope that the world leaders will all work to keep us at peace. what does this mean please ? Mr Churchill was indeed a wonderful man. We owe our freedom to his wisdom and courage. As a boy I remember the pride and inspiration given to us by the great Winstons courage and leadership.We had to grow up much faster in those dark days.Would that we had men and women of Churchils calibre in these sad modern times to govern our once great nation. Search Winston Churchill murderer and see both sides of the story. My aunty who died many years ago hated the man. She was born and bred English. I was interested to find out why. So I researched it. Very interesting when you see both sides to the story.